These photos show a few items in my ever-growing collection of "All Things Tea." I began collecting teapots, tea cups and saucers in the 1980's and later branched out to collect what I call "all things tea." Well, almost ALL things tea. There are a few tea things I can pass up, but not many! I buy tea things while traveling, at antique malls, online and more. 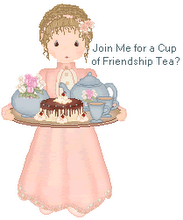 I am always looking for tea decor and collectibles. Several friends and family members tell me they think of me when they see anything to do with tea! As result, I have received many tea-themed gifts. I love them all! 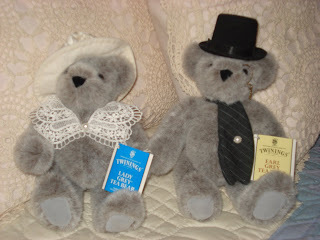 Earl Grey Bear and Lady Grey Bear were purchased several years ago from Twinings by my husband as a Christmas gift. The teapot quilt on the bed in the photo is from Pottery Barn Kids and is no longer available through them. I was thrilled to find it on Ebay. The throw pillow was given to me by a friend. These are just a few things in my "all things tea" collection. I will share more later. Oh, wow! I LOVE that quilt!